Custom quarter zip sweatshirts are versatile and comfortable accessories that can be used to dress up or down for the day! Ideal for beach parties and BBQs, these classic styled quarter zip are always in vogue. Let them usher in the cooler weather in these logo imprinted 1/4 zip sweatshirt from ProImprint, which has one of the most diverse collection of these trendy wears. These make value added promotional gifts to promote gyms, hotels, golf resorts, sports products, local sports clubs and more! 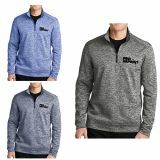 Give one of those personalized quarter zip sweatshirtsto your team as a corporate gift to drive up your brand appeal not just in office but also outside. 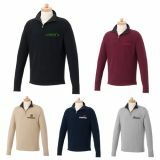 Every time your staff turns up in these trendy sweaters, the brand gets instant attention and appreciation. 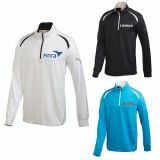 These logo imprinted quarter zip sweatshirts look great when worn alone or as a layering piece. Made from breathable cotton poly blend, these sweatshirts are designed for long term use and rough handling while the waffle thermal lining makes it a perfect option for chilly outdoors as well. These promotional quarter zip sweatshirts will add a punch to even a low key budget promotional campaign in no time. Available in a range of attractive colors and designs, these sweaters have a smart athletic cut, which add ups to its appeal as a sports wear. 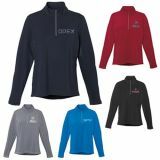 Anyone will love these stylish logo imprinted quarter zip sweatshirts for its style and utility and will cling on to it for years to come. 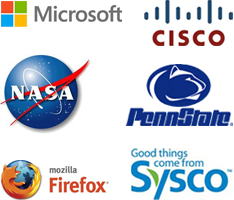 These make smart cap ideas to enhance your brand recall and to thank your customers. 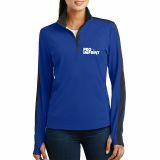 Order these quarter zip sweatshirts from ProImprint and add a style tag to your promotional campaign with ease. Logo printed ¼ sweat shirts also make thoughtful gifts for employees and family members during milestone celebrations and anniversary functions among others. These custom quarter zip sweatshirts ensure you the best of both worlds of customer care and brand promotion. 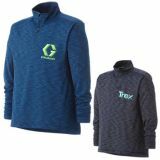 At ProImprint, you can choose from an exciting range of colors and designs and we can help you make your custom quarter zip sweatshirts something special that everyone else is going to be crazy about! Featuring the best brands in the industry, these sweatshirts will keep your customers look good and feel great all the time. Add to it the advantage of super savings on bulk orders and you'll be giving the best apparel in town at ridiculously low prices! Some of the trendsetting styles and designs of these personalized quarter zip sweatshirts are only a few clicks away at ProImprint. 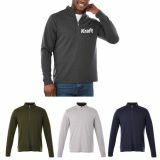 If you think that selecting from the multitude of choices is not easy, please contact us at 844-776-4677 or email usat info@proimprint.com and we can help you to pick out the best promotional quarter zip sweatshirts that match your budget and brand appeal easily!